British Foreign Secretary Boris Johnson and Russian Foreign Minister Sergey Lavrov attend a news conference following talks, Moscow, Russia, Dec. 22, 2017 (AP photo by Pavel Golovkin). 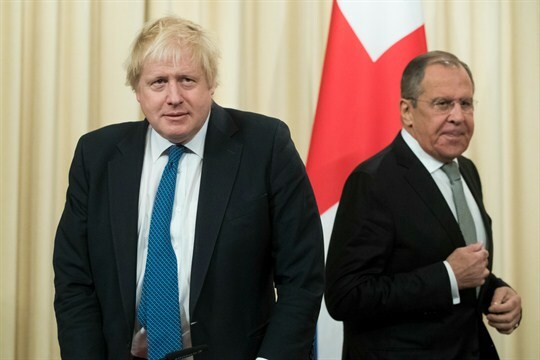 In late December, British Foreign Secretary Boris Johnson had a tense meeting with his Russian counterpart, Sergey Lavrov, during a visit to Moscow—the first by a British foreign secretary in five years. Johnson and Lavrov clashed over allegations of Russian meddling in European elections and the U.K.’s Brexit referendum. Lavrov admitted it was “not a secret” that the relationship between Russia and the U.K. was at a “very low point.” In an email interview, Duncan Allan, an associate fellow with the Russia and Eurasia Program at Chatham House in London, discusses the nature of the tensions, their economic impact and the prospects for mending ties.